"Nothing like the direct approach." Hobbies: Cooking, Bargain-Hunting, Chasing Boys. Makoto is a scrapper. She is easily the toughest of the inner scouts. She was expelled from her old school for fighting. 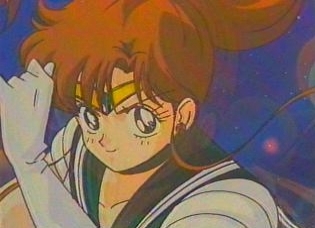 Her schoolmates fear her reputation, so before meeting Usagi and the others she didn't have many friends. But beneath the tough exterior, she is kind and generous. She is a domestic animal. Cooking and cleaning are her forte, but she cultivated those skills only because she wanted to be known for something besides her fighting ability. She also has the bad habit of falling hard and fast for any guy that catches her fancy, often exclaiming: "He looks just like my old boyfriend!" Makoto has a deep desire to let her feminine side shine through, to show everyone that she's not the ferocious bully that she seems to be, but is actually a kind and beautiful young woman, like any other girl her age. She goes to Juuban Junior High school, and later, Juuban High. Makoto has a different uniform 'cause she's too tall for the regular one. She's the tallest inner senshi. She fears airplanes because her parents died in a plane crash. Her castle is the Io castle. She idolizes Haruka and wants to be just like her. But they are only friends, nothing more. Crystal key! Take me home!